Your attendees can pay for their event registrations with a credit card or using services like IDEAL, Bancontact, SEPA Direct debit, Giropay, PayPal, Sofort Banking, and others. Need to Buy a Support License for the Mollie Payment Gateway for Event Espresso 4? Download the latest version of the Mollie payment gateway for Event Espresso 4 from your Event Espresso account. 1) Under ‘My Account’ (Mijn account) click on “Website Profiles” (Websiteprofielen). 2) If you do not you already have a website profile you will need to create one here, or if you have one already, you will need details from within from within the profile. 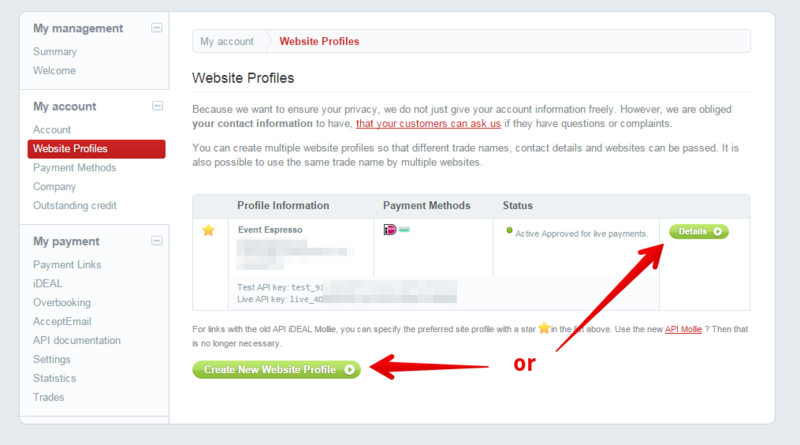 3) If you need to create a new website profile enter the requested details such as website URL, company name and your email address otherwise click ‘Details’ on a current profile and skip to the next step. 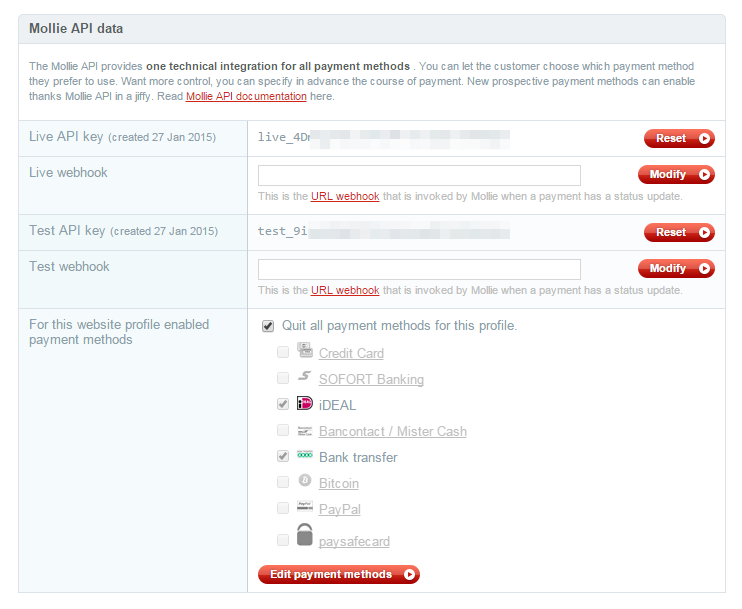 4) Now you have a website profile you need the API key from within to use within the Payment Method. If testing payments use the ‘Test API Key’ otherwise use the ‘Live API Key’, copy the key and save it within the Mollie API Key field in the payment gateway. You do not need to set any webhooks as Event Espresso does this automatically for each payment. 5) Activate iDeal through ‘My Account’ (Mijn account) -> ‘Payment Methods’. Your Mollie.com account allows you to select multiple Payment methods. However the Mollie Payment Gateway integrates with the iDeal payment method. This account has the ‘iDeal’ and ‘Bank transfer’ payment methods active, however only iDeal will be available to your users for payments. If you enable the Credit Card option within your Mollie account it should show within the available payment methods once the user is directed to Mollie and work fine within Event Espresso. You can do that within your Mollie account -> Payment methods -> Credit Card. I tested this with the account with have for Mollie, and it worked as expected within Event Espresso. Will Mollie be the only payment method enabled or the only one you offer? Click here to learn how to make it selected by default during the registration checkout. An account with Mollie is needed to accept payments via Mollie. Login to your WP-admin (WP Dashboard) and go to Event Espresso –> General Settings –> Payment Methods. Once on the Payment Methods screen, click on Mollie and click on the button to activate the payment method. 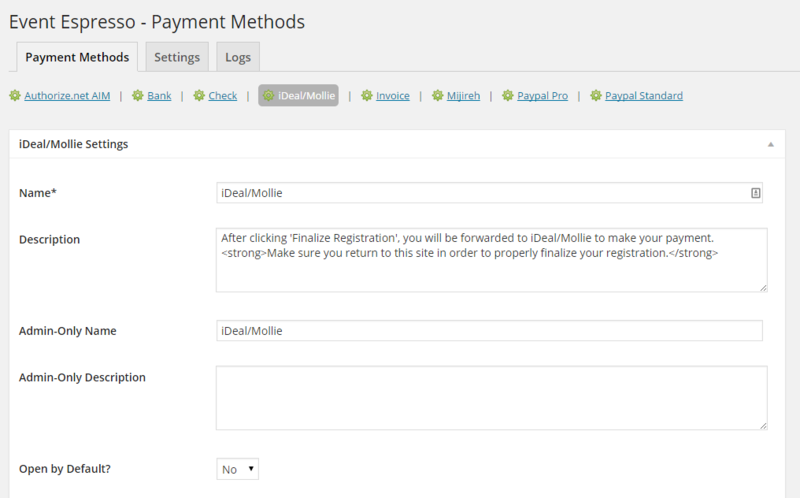 Mollie API Key – This credential is needed to process payments and can be found in your Mollie.com account. The Mollie payment gateway will allow you to take online payments through iDEAL and other popular payment services in Europe. This is an offsite payment gateway which means that attendees/registrants are transferred over to a secure page at Mollie.com to process their payment. They are then returned to your site to view their registration confirmation. An account with Mollie.com is needed to accept payments via the Mollie gateway. I configured Mollie and payments are not being processed. Can you help? How can I set up a recurring payment or subscription through Mollie? Recurring or subscription payments are not currently supported in the Mollie payment gateway. 2) Then login to your Mollie account and process the refund.